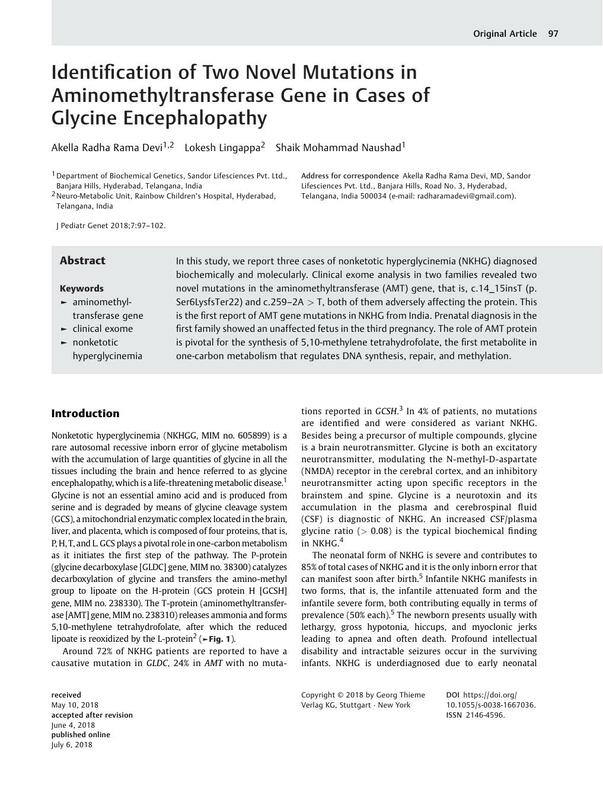 In this study, we report three cases of nonketotic hyperglycinemia (NKHG) diagnosed biochemically and molecularly. Clinical exome analysis in two families revealed two novel mutations in the aminomethyltransferase (AMT) gene, that is, c.14_15insT (p.Ser6LysfsTer22) and c.259–2A > T, both of them adversely affecting the protein. This is the first report of AMT gene mutations in NKHG from India. Prenatal diagnosis in the first family showed an unaffected fetus in the third pregnancy. The role of AMT protein is pivotal for the synthesis of 5,10-methylene tetrahydrofolate, the first metabolite in one-carbon metabolism that regulates DNA synthesis, repair, and methylation.